The Mail on Sunday today reveals the extraordinary web of political and financial interests creating dozens of eco-millionaires from green levies on household energy bills. A three-month investigation shows that some of the most outspoken campaigners who demand that consumers pay the colossal price of shifting to renewable energy are also getting rich from their efforts. It was with great dismay that I read about the recent Grimsby council meeting where it was voted that Grimsby would not be voting the same as neighbouring West Lincoln in their stand as “not a willing host” for industrial wind turbines. In fact, Grimsby would be at opposite ends of the industrial wind turbine spectrum by saying Grimsby is not unwilling — a confusing, double negative way of saying that Grimsby is a willing host for wind turbines. I believe that the Grimsby council is being unrealistic about the fact that they will never have wind turbines in their area. That is a speculation that no one can assure. The area above Grimsby is a perfect area for wind turbines. The farmers are no long growing grapes. The vineyards are pulled out. Taxes and upkeep are still high. The temptation of earning up to $50,000 per year per turbine is hard to resist. The wind velocity is favourable. Already there are rumours that land owners around the Grassie area have been approached. There may also be the opportunity to establish wind turbines off Grimsby in Lake Ontario. Who knows? No municipality or town is safe from the invasion of wind turbines. Do not assume that your town of Grimsby is secure. Just ask the people in Haldimand, Chatham Kent, West Lincoln. Look on line at http://www.Ontario-Wind-Resistance.org. Check out the Mothers Against Wind Turbines site. Of course if your council refuses to take the threat of wind turbines seriously then I am not sure what the local voters can do. We have heard how the majority of councillors feel but how do the people of Grimsby feel about this? As there have been no resident comments in the paper to date, it is assumed that Grimsby folks are fine with their council’s decision. However, in the meantime there is a reciprocal agreement here. If you cannot support our municipality, then as a resident of West Lincoln, I cannot support your town of Grimsby by shopping, enjoying sports events, food establishments or services in the future. It is a small note of opposition, but we have the right to make that stand considering the recent decisions of your council. Grimsby will not be unwilling host article. NIAGARA – After years of work, the Region and Rankin Construction are poised to dissolve their partnership, set up with the goal of building giant wind turbines in Wainfleet to generate electricity. Way back in late 2006, the Region approved the partnership to build five wind turbine towers soaring more than 30 storeys high, at a cost of $23 million. Just a month before ago, Rankin chief executive officer Tom Rankin — a steadfast believer in the promise of wind power as a renewable energy — expressed his frustration over the years of studies, debate and changes at the Region he’d had to endure since he started pushing the idea about 12 years ago. Thursday night, regional council approved the extension of the Wind Energy Niagara shareholder between the Region and Rankin Construction until next June 30, to allow time for steps to be towards dissolving Wind Energy Niagara as a corporation. Regional chief administrative officer Harry Schlange said in a news release that the wind turbine partnership made sense when it was approved because it was a good fit with the Region’s push for environmentally friendly technologies. But he said the landscape for investing in green energy has changed since 2006. He noted Wind Energy Niagara has been unable to obtain an energy supply contract under the current Feed in Tariff (FIT) program with the Ontario Power Authority. In addition, changes to the FIT competitive process are in the pipeline, but how that will work for large FIT project has yet to be determined, Schlange said. That, plus Wind Energy Niagara’s dated leases, wind data and environmental studies have greatly hurt the partnership’s chances of landing an electricity supply contract, he said. The partners have not invested any money into the project since 2011. Rankin joined another, private sector venture — Wainfleet Wind Energy Inc., launched by the Loeffen family in 2009 to build large wind turbines in Wainfleet, in 2012. That partnership got provincial approval to erect five wind turbines, but a neighbouring business appealed that, and two of the towers are on hold until a tribunal makes a ruling. Rankin said in the news release that he is still a firm believer in the benefits of wind energy despite the looming dissolving of the partnership with the Region. The Region said it will be returned its original investment of $577,000, less minor administrative and legal expenses. But the Region’s share of project development costs, applications, environmental assessments, wind resource studies and other expenses was about $420,000. Story here. We Need Your Help….Let’s Fight the NRWC project and protect our families and community! We need your help. After sorting through the entrails of the NRWC proposal for the last eight months the Ministry of the Environment has decided that the documents have all been submitted. The West Lincoln municipal council and concerned citizens in the community have spent thousands of hours pouring over the same documents and have sent hundreds of letters to the MOE drawing attention to errors, omissions, inconsistent noise sound levels, etc. …. the list goes on. The NRWC proposal has been posted for a 60 day public review and comment period starting December 03, 2013. First I would like to register my extreme opposition to the NRW Industrial wind turbine project. We are all aware that Industrial Wind Turbines produce mechanical noise, acoustical noise, low frequency noise, infrasound, in addition to electro magnetic radiation, “dirty electricity” or transient voltage, light flicker, vibration as well as electricity. Any of which can create problems for the neighboring recipients. With all these additional “by products” of wind energy it is reasonable we would want an independent third party scientific investigation to determine if any health and safety issues exist for people in communities that are forced to host Industrial wind turbines. According to the 2013 Auditor General’s Report p.316 “the report issued by Ontario’s Chief Medical Officer of Health citing no linkage between wind turbine noise and adverse health effects was NOT OBJECTIVE!” Please consider the work of Carmen Krogh – Open Submission: Risk of Harm to Children and Industrial Wind Turbines – Health and Social-economic Impacts in Canada Submitted by Carmen Krogh, BScPharm May 15, 2013 Children living in homes exposed to the noise and other emissions of industrial wind turbines are reported to suffer adverse health effects and may be at risk of mental and / or physical adverse health effects similar to that of their parents. Vigilance and long term surveillance systems regarding risks and adverse effects related to children are lacking. Such programs are necessary to evaluate the risks to children who have been exposed to industrial wind turbines. This evaluation should take place before proceeding with additional approvals. Canada has committed to four general principles: “… non-discrimination, the best interests of the child, the right to life, survival and development, and respect for the views of the child”. An inequity appears to violate the principle that all children are to be treated equally i.e. that of “non-discrimination”. Rural children are at risk of harm when wind energy facilities are sited in close proximity to family homes and many parents do not consent to this risk. 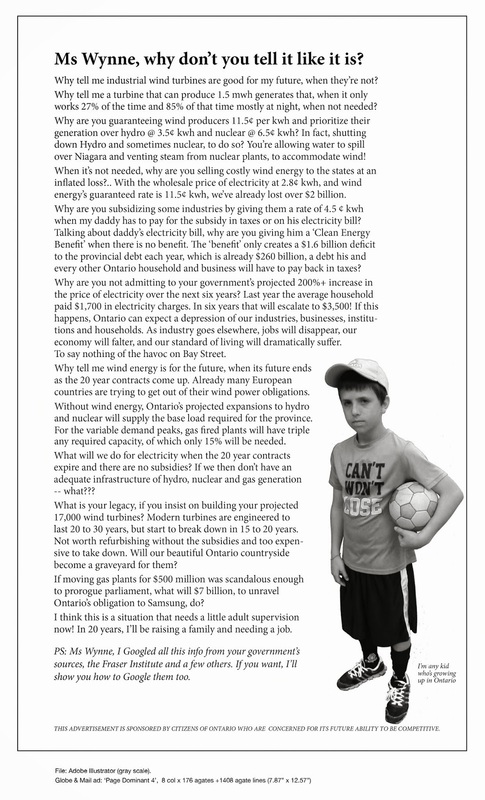 As the result of the anticipated proliferation in the future of industrial wind turbine facilities in Canada, it is expected more Canadians, including children in general, and those with special needs such as autism, epilepsy, migraine and those with respiratory disorders will be at risk of harm. Risk of learning/cognitive difficulties is a risk. Action by Health Canada would support its “Mission and Vision”” as the responsible authority to help “people of Canada maintain and improve their health” and its “Objectives” to “prevent and reduce risks to individual health and the overall environment”. The Policy Interpretation Network on Children’s Health and Environment comments on the use of the precautionary principle i.e. prevention: Policies that may protect children’s health or may minimise irreversible health effects should be implemented, and policies or measures should be applied based on the precautionary principle, in accordance with the Declaration of the WHO Fourth Ministerial Conference on Environment and Health in Budapest in 2004. Regarding precaution, the World Health Organization states: “…where there is a reasonable possibility that public health will be damaged, action should be taken to protect public health without awaiting full scientific proof.” There is an opportunity for Health Canada to invoke the precautionary principle. Until guidelines are established that protect human health and social-economic viability , no further development of wind energy facilities should occur and existing sites reporting health issues should be resolved to the satisfaction of the those reporting health impairment or risk factors. 2. The MOE’s Renewable Energy Approval (REA) regulations, recommendations and requirements are inadequate for today’s wind turbines and were hastily conceived but, even worse, they are not rigorously and rigidly applied. The 3 MW Enercon industrial wind turbines proposed by NRWC are the largest IWT’s installed onshore in North America. These 60 story industrial installations require extensive “mitigation” strategies and this proposal should be rejected. These industrial wind turbines are too big, too many and too close to schools and rural homes where we live, work and play. 3. Where are your Health studies? Where is your procedural outline for how members of the community record impacts to their health caused by the Industrial wind turbines you propose to erect in West Lincoln? Where is the mitigation policy for health impacts? 4. How will the maximum 40 decibel noise pollution level be monitored? What is the mitigation procedure when the noise level is above 40 decibels? Who will have the authority to shut the Industrial wind turbines down when the noise pollution level is above the 40 decibels? Under what conditions will the municipality have the authority to shut the Industrial wind turbines down? 5. The installation of Industrial wind turbines is an Industrial use of agricultural land. What is the classification of the agricultural farm land being taken out of production for each specific Industrial wind turbine? How many acres of farm land will be removed from agricultural production for the installation of each turbine? How many acres of farm land will be removed from agricultural production for the service roads required for each turbine? 6. How many ground water wells are within 1 km of each turbine? 2 km? 5 km? Where is the mitigation plan if the ground water wells become contaminated or the flow decreases or ceases? How will you guarantee safe drinking water for the people and the animals in this agricultural community? 7. What is the depth of the footings required to erect a 600 foot Industrial wind turbine? Where is your study of the underground topography at each Industrial wind turbine site to the depth of the footings? 8. Members of the community are continually reassured that property values will not be affected by this initiative. Denmark compensates people if the property devaluation is more than 1%. Why has no compensation package been developed for rural people who experience loss of property value? 10. Where are your Emergency Plans for fire in the nacelle? Who will pay for the equipment needed for such an emergency? What additional insurance will be provided to neighboring receptors whose person, property and livestock may be affected by fire, ice throw, blade throw, contamination from oil spills, electro-magnetic radiation, transient voltage, etc. 11. Bats are extremely important to agriculture and it is irresponsible of you to locate an Industrial wind turbine within two km of a bat colony. Bats are being killed by Barotrauma, as in the change of air pressure behind the turbine blades. According to NASA and a Danish Study this change of pressure requires 2000 meters to return to ambient conditions so your mitigation if more than 10 bats are killed per turbine per year is an insult and instead you will reduce or eliminate this colony. How will you compensate neighbouring farmers who will be using more chemicals to control insects that the bats would have eliminated? The BATS ARE GREEN not your Industrial wind turbine that produces mechanical noise, acoustical noise, low frequency noise, infrasound, electro magnetic radiation, “dirty electricity” or transient voltage, light flicker, vibration as well as decreasing property values for everyone in the view shed! 12. more to follow. PS As I sit here in my snowsuit, freezing in the dark, maybe coal will be a good gift this Christmas. Windweasels abandon off-shore turbines….due to sharks. Well, isn’t that interesting. That is one solution that I never even considered. Windweasels, as shark bait. Sounds like karma to me. Instead of wind sharks, quietly circling communities….we have real sharks, circling the land-sharks. Now we know how to get rid of the unwanted wind-pushers, when they come into our communities…..Just tell them to scram, or we’ll EAT them!!! LOL! Cost Benefit - NOT, Energy Ripoff, fighting big wind. I have taken your advice to heart and made sure my energy literacy meets with the latest knowledge and understand of my electricity bill by reading all of the latest instructions posted on all of your recommended websites as well as using all of your calculations according to your math. Somehow my cup of Tim Horton’s coffee seems to cost me more. Could you please let me know where you get these special deals at Tim’s? Honestly I really do agree that we should focus on conservation. I have done that to the point where I actually decided to leave my house and live outside of the Province where I can use the same amount of electricity, but at a much lower rate. That should really help conserve electricity in Ontario! Unfortunately I did have to leave minimal electricity on so my pipes would not freeze over the winter.In spite of all this conservation, when I received my first bill, it was still a shocker. Perhaps I need a little more instruction from you personally. Metered usage in kilowatt-hours (936.3120×1)=936.3120 kWh “Wow! That is some smart meter to compute all of that. Now from the meter reading the bill also tells me that since summer rates are effective until October 31, according to my meter reading I am receiving 7 days of the “summer rate” and the remainder is billed at the “winter rate”.This smart meter also seems to know exactly how to split up the usage of 936.312 kWhours between ON-Peak, Mid-Peak and Off-Peak rates as well as the amount of kWhours used on summer rates and winter rates. That is some SMART METER. And, even though my bill says Hydro One read my meter, there was not even a person that had to come to the house physically to check on this. I guess SMART METER knows best! Now I won’t bore you with the details of the breakdown. Suffice it to way I really work on conservation when my off-peak is only half as much as my on-peak and Mid-peak is less than half of my on-peak. I could of course persevere and use ALL my electricity during off-peak leaving much more available for all those factories that need it during the daytime on-peak hours, especially since all those turbines generate power at night when we can’t possibly use all that power and have to beg others to please take it “cheap”. Of course then my pipes would freeze, especially in the winter when global warming still does not keep daytime temperatures above freezing. So when I add up all the various prices charged for electricity and look at my total bill, I discover that the Delivery charges, the Regulatory charges and the debt retirement charge along with HST are 2-1/2 times as much as what I pay for electricity. Incidentally the bill is not as SMART as my SMART METER. I had to total this up on my calculator. Now, isn’t it nice, the Ontario government is taking 10% of my bill from some other tax payers (not me hopefully) that have been added to Ontario’s treasury via revenue streams and giving me this as a credit on my bill! That almost pays for that miserable HST! Now for some reason when the last rate adjustments were made it left something stranded that I didn’t have to pay for right away, so there is this little $11.39 amount left hanging there at the end of my bill. This seems to be on every bill, but it does not tell me when it will stop or when I finally have to pay or get this adjustment??? Perhaps I have to go through all my bills and figure this one out. While I am informed that this is Real-Time Billing Payment Plan with $0.00 remaining, it still extends $11.39. I don’t think you could answer this just off the top of your head?My bill also has little * to make sure I understand that there is electricity lost somewhere along the wires. It really does not tell me how much, but that this is accounted for in the delivery charge so I just have to trust you and Hydro One on this. The charges I am told are fixed, but not ALL fixed and some are variable depending on how much electricity I use. I certainly am contributing via my bill payments to infrastructure (I am assuming all the poles, wires, transformers, etc.) and not least of all the wonderful renewable energy programs which even though we can’t use all that electricity that renewable energy provides we should be proud to make our contribution – even if we now have to pay extra for a lot of these to be shut down do not produce electricity. That last part will no doubt help preserve a few bats and eagles from being sliced up.I certainly hope you can tell me how I could conserve better, or even if I used NO electricity, would I still have to pay to nevertheless maintain Ontario’s infrastructure, power lost on the lines before it never got to my house, and certainly to keep all the blades spinning on those big towers that produce electricity that is not needed and have to be shut down, but so these companies don’t lose any money and might leave Ontario or go bankrupt, we still have to keep paying them to not produce electricity. I guess all those charges would still be on my bill – did I hear somewhere this was a global adjustment assumingly factored into the delivery charge? It does not really mention that term on MY bill.If you have a problem answering my questions perhaps you could first refer to advice you may not have read yet. You could link in to these and you might find them helpful since it states you are firmly in charge of our hydro bills:http://ep.probeinternational.org/2013/12/12/parker-gallant-minister-of-energy-bob-chiarelli-firmly-in-control-of-our-hydro-bills-2/or if all else fails, perhaps you will find some experts here:http://freewco.blogspot.ca/2013/12/energy-planning-in-ontario-who-do-we.htmlI am certain Parker Gallant has written quite a few letters and columns that surely would augment the recent suggestions made by Ontario’s Auditor General.Then again, I was just reading the China’s renewable energy seems to have problems with both solar and wind on life support. http://opinion.financialpost.com/2013/12/09/why-chinas-renewables-industry-is-headed-for-collapse/Perhaps you feel that China needs help from Ontario and your long term energy plan has backed off nuclear and wants to include lots of wind and solar. That certainly is generous and the some 130 wind turbines recently added within several of projects newly approved should help out with China’s production /sale problems. No doubt China will extend their gratitude and certainly your advice on how all the people of Ontario should better manager their power consumption are also grateful to you for your generous advice.If Ontario has a problem with revenue streams, certainly the World Bank will stand by to help and the IFM is known to also give good advice on how to better manage our consumption of everything. Perhaps they would like to take part in the next Webinar. They might help better than all those engineers that worry too much about engineering and science. They perhaps can certainly help with financing all those new projects. PS—Not for me, but all those people who save on electricity by not using their clothes dryers during the winter, do you have a good advice on how best to handle frozen clothes? Congratulations, to the people of Tennessee for saying NO to Agenda 21! The internet has been crucial, in educating people about the subterfuge that has been going on between the UN, Faux-green environmentalists, and many governments. Agenda 21 would destroy life as we know it, and reduce everyone to government controlled sardines, living in government run apartment style housing. This is not what our forefathers fought for. We will not give up our democratic rights. Read and weep wind pushers. Your day in the sun will soon be over. China’s aggressive push to “green” its economy and become the world leader in renewable energy is admired by many commentators in the West. Those admirers need to look again. The country’s solar panel industry, which went from zero to become the world’s largest in five years, has crashed, with most producers now suffering from negative profit margins, soaring debt levels and idle factories. Solar panel manufacturer Suntech, a national champion which became the world’s largest thanks to lavish state subsidies, filed for bankruptcy in March after it defaulted on payment of $541-million of bonds. The government is scrambling to tidy up the mess by offering tax breaks to all solar companies that acquire or merge with their competitors. One state-owned company recently tabled a $150-million lifeline to Suntech as it works its way through bankruptcy proceedings. The key to Global Warming, is Major League Baseball?….a direct correlation! You must see this interesting set of graphs. It shows how simple it is to tweak information, to suit your agenda. It looks reasonable, at first glance….LOL!